Start your review of Assad 'Bond' Hussain. Send a message to Assad 'Bond' Hussain. Thank You! Your message has been sent to Assad 'Bond' Hussain at Peel Chrysler Jeep Dodge RAM. "Worth the 5 hour drive"
Wevleft Greater Sudbury after my night shift with my wife at the wheel Friday. We had already organized everything by email, text and phone with Peel Chrysler during the week after selecting our new vehicle on line. The truck, as promised, was ready to go. After a few signatures and a hit of expresso we were out the door within the hour with an extra year of free warranty and better then agreed financing. Friendly, prompt and amazing service from Sal and Bond. THKS for all your help guys. I was in the market for a new Wrangler and Sal was great. Assad was very informative when explaining the financing as well. I would not buy a vehicle from anyone else. Great experience. Thanks Sal and Assad! "All OK. Car is fantastic. No issues so far." Bought the Dodge Caravan over the phone from Paul Kolabatic. Very knowledgeable and friendly, and gave an excellent deal! 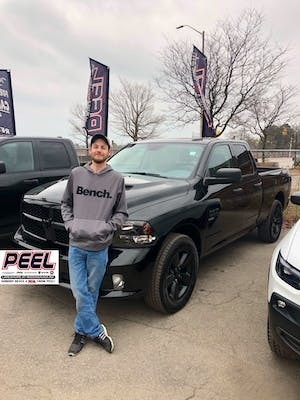 Thank you Paul and Peel Chrysler! Great people to work with made the process of buying and financing a breeze! Zachary Tune went above and beyond as a sales representative!! Would recommend to others - no deal beats Peel!! "Clean, clear and as agreed deal, thank you." 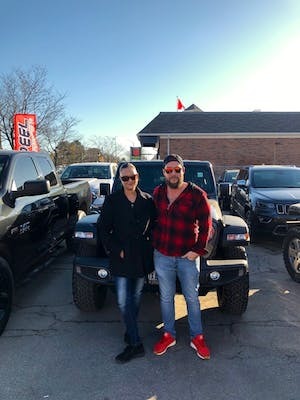 I purchased a 2019 Dodge Ram Rebel from Chad Bu-Mansour at Peel Chrysler. I live east of Ottawa so I was hoping to find a truck in my neck of the woods. 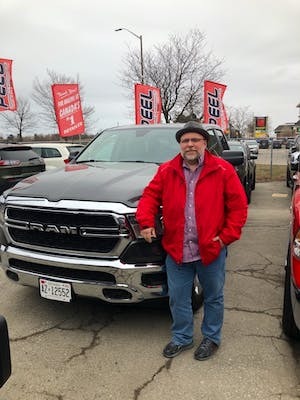 After shopping at over 25 dealers from Cornwall to London, I drove 600 kms to buy the truck at Peel Chrysler and that too after reading some negative reviews online. But I had done my homework, was clear what I wanted, my last price and terms. And Chad got it all worked out and the entire process was clean, clear and as agreed. So i recommend two things do your homework and give Peel Chrysler a chance to show you the difference. Purchased a truck from this dealer and they made me wait 3 months. They never had a reason for the delay. I got tired of waiting took my deposit back and went to brampton Chrysler and purchased a jeep with no problems. I keep telling this dealer to stop sending me emails and stop contacting me and they still do. I will never go back to this lying dealership I will never recomend them and if you don't like what i have to say, to bad I told you stop contacting me. We got a very friendly service and great deal from Sal. Very happy with our purchase. Love our new Chrysler Pacifica. Would recommend Peel Chrysler to anyone. "Friendly and very professional "
Great service and personal touch from a very busy place. Took what I wanted into consideration and got me in the perfect vehicle. Highly recommend!